From pools and dining spaces to playgrounds, we understand every outdoor environment is different, which is why we offer a variety of outdoor canopies. When you're looking to add shade to your space, it's important to consider quality. 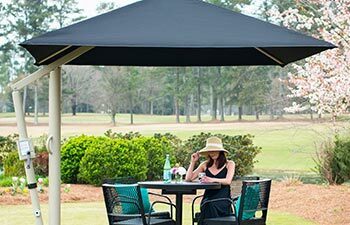 We at SRP Shade manufacture our commercial canopies with the best materials and techniques so they last for years to come, which make our shade canopies very different than those you would find at your local store. No matter the type of space you're looking to shade, we can provide the best solution to fit your needs. Check out a few outdoor canopy solutions below and contact us to start planning your shade project! If you need a portable canopy, consider our Portable Cantilever Umbrella. It can be used in a variety of spaces including outdoor dining areas or pool lounge spaces. While it's designed to be portable, it is also wind rated making it great for commercial use. This cantilevered umbrella can be opened and closed in less than one minute. Canopies for pool areas are always great because they help protect guests from the sun's heat and harmful UV rays. 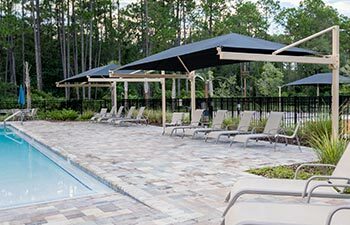 From shading pool-side lounge areas to areas of the pool itself, there are a variety of outside canopy options that you could use. Consider hip ends, cantilevers, waterproof umbrellas, or sail shade canopies just to name a few. Shading playgrounds with outdoor canopies has many benefits. 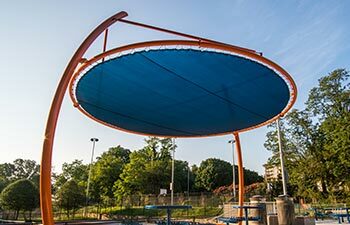 Not only does it protect children from UV rays, the playground canopy can also protect play equipment and keep the play area up to 25 degrees cooler depending on the fabric. 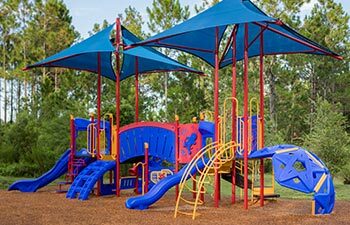 We offer modular shades that are incorporated into the play structure as well as freestanding shade canopies. These shades are often rectangular in shape and come in many standard and custom sizes. In addition to our standard outdoor canopies, our team of talented engineers and designers can create a custom shade to best fit your space. Custom shade canopies are found over parking lots, walkways, playgrounds, and at hotels and resorts. Contact us for more information on custom sized shades and let's see what we can do for your location.